What is governing of steam engine? 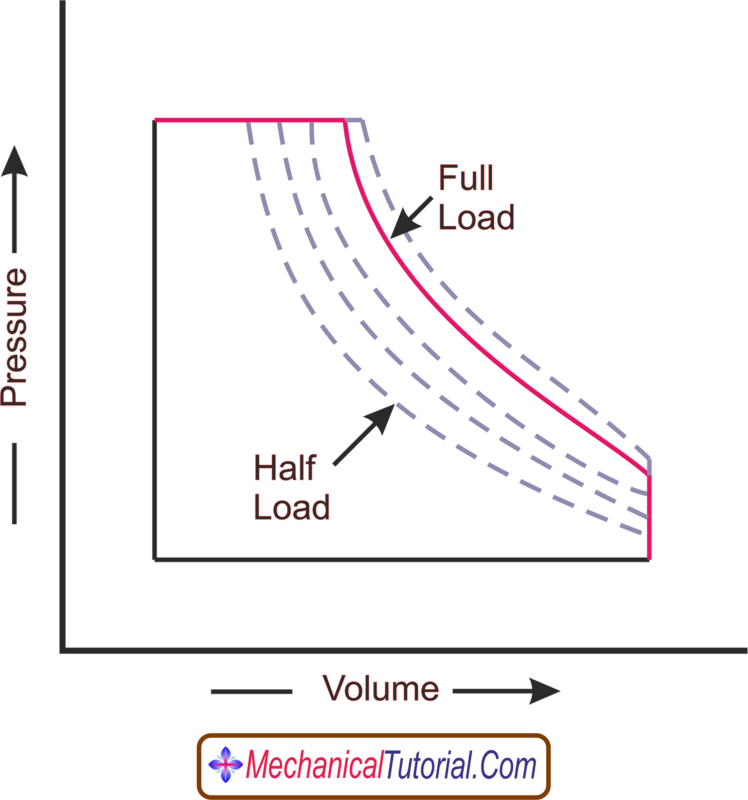 In a steam engine, increasing load will increase the in the engine cylinder and decreasing load will reduce the work in the cylinder.As per indicator diagram, the area of the indicator diagram is equal to the work done in the engine cylinder.So more area of indicator diagram will grater amount of work done in the cylinder and less area of indicator diagram will reduce the work of the steam engine.According to the load on the engine, work done in the cylinder may be increased or decreased by controlling steam pressure.Governing of steam engine is a process where above two methods are to be controlled. In this page, we will discuss the following two governing methods of simple steam engine and compound steam engine. 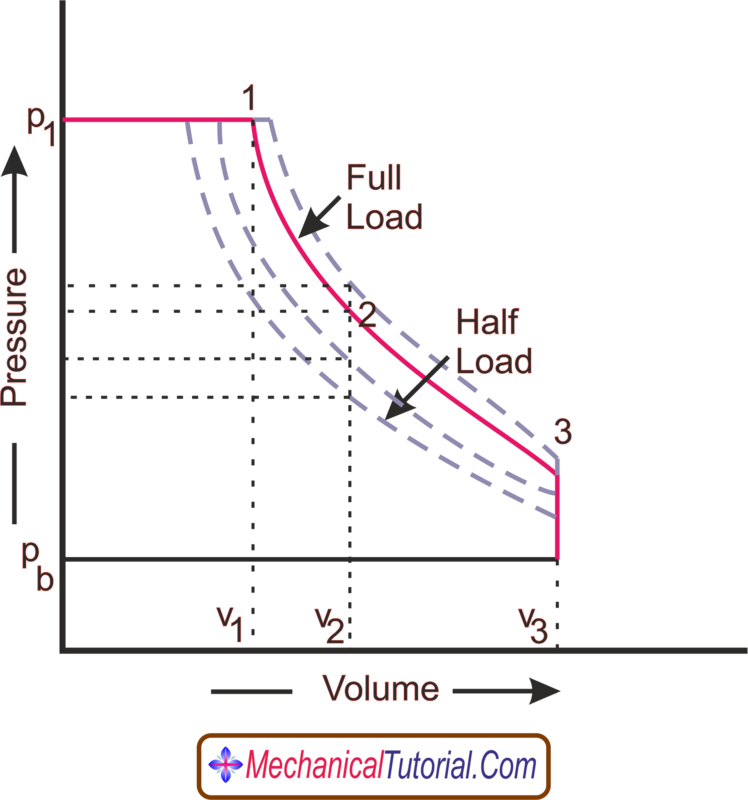 Throttle governing of a steam engine is a method where a throttle valve is placed under the control of centrifugal governor to control the engine output by varying pressure of intake steam.The valve is placed in such a way that the pressure of the intake steam may vary by opening or closing the valve.The above picture shown the pressure-volume (p-v) indicator diagram of simple steam engine with full and half load.Now if the load of the engine is increased or decreased , it's speed should be increased or decreased and area of the indicator diagram should be increased or decreased.But practically engine speed does not change.It continuously runs at high speed at decreased load.But as per engine's construction, it should be run at lower speed at low load.To control the speed of the engine, pressure of the intake steam must be low and the steam is controlled by the throttle valve.To apply this method, output of the steam engine can be changed by controlling the inlet steam pressure.Throttle governing of simple steam engine reduces its thermal efficiency, as well as, wastage of steam.That's why full steam is not been used under low load condition. Cut off governing of a simple steam engine is a method to control where the engine output can be controlled by varying the volume of intake steam.To apply this method, a slide valve which is controlled by a centrifugal governor is placed under it.In the above picture shows the indicator diagram of simple steam engine.As we see that the speed of the engine does not decrease in lower load.To decrease the load of the engine, the area of the indicator diagram should be reduced.In cut off governing system, speed of the engine is reduced by reducing the volume of inlet steam enter to the engine cylinder. In this system, output of the compound steam engine can be controlled by controlling the intake steam pressure.A throttle valve is placed under a centrifugal governor for controlling the steam pressure.The above picture shows indicator diagram of compound steam engine.In the engine, steam pressure expands completely in H.P. cylinder and incompletely expansion in L.P. Cylinder.Now if the load of the compound engine decreased, the area of the indicator diagram shown in the picture, is required to reduce and speed of the engine should be decreased.But engine runs at higher speed.To decrease the speed of the engine, this mechanism is used.In this mechanism, a throttle valve is used for passing the steam at a required pressure in the engine cylinder to control the speed of the engine.To apply this process, engine runs at high speed at pick load and speed is decreased at low load.In throttle governing of a compound steam engine, work done in H.P. cylinder is more reduced whereas work done in L.P. cylinder is slightly reduced. cut off governing of compound steam engine is a method to control the engine output by varying volume of intake steam in H.P. 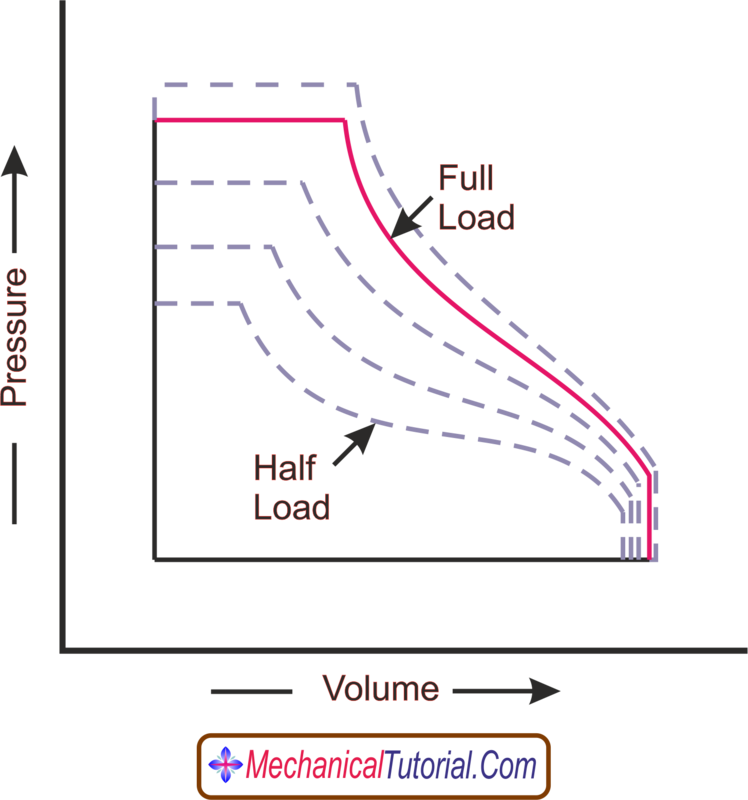 cylinder.It is done by varying cut off point under the control off centrifugal governor.As per indicator diagram, engine runs at a higher speed at high load shown in the p-v diagram.But engine tends to move at higher speed at low load.As per diagram,it should be run at lower speed.In this method, area of the indicator diagram is reduced by reducing the volume of the intake steam shown in the figure. 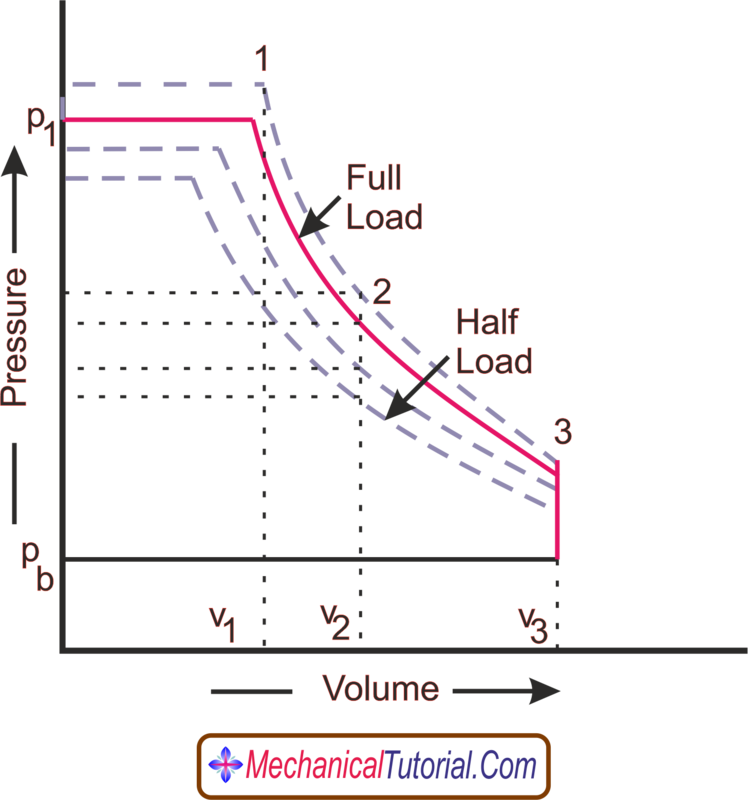 Similarly, if load is decreases, volume of the intake steam is also further reduced.